Yes, obviously I had an extra lot of fun drawing this. Originally baby Cthulhu was supposed to be juggling baby seals, but it got late and the seals weren’t working. Just imagine that’s what would have come next. I feel like I’m finding my way a little more easily; drawing panel 1 was such a joyful experience, and panel 3 came so easily. Panel 2, I was just giggling the whole time I picked colors. Just doing my best here. Have ideas. Go with them. Figure it out along the way. Valkyrie mermaids! Goth rave Alice in Wonderland tea party! Baby Cthulhu juggling baby seals! There is a funny place inside if you know how to get there. It’s late and I’m feeling more visual than verbal. Been tired and headachey all weekend, probably because there is a fire on the mountain and the air quality is terrible. 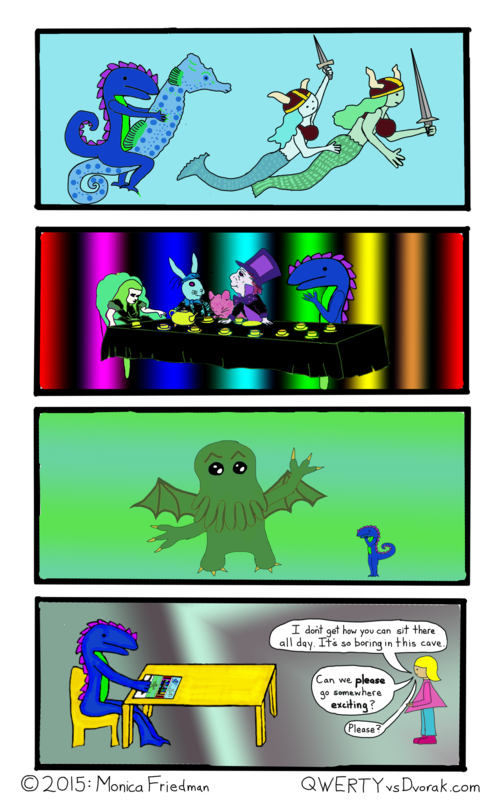 This entry was posted in dragon, dragon comics and tagged alice in wonderland, comic, cthulhu, dragon, drawing, goth rave, imagination, mad tea party, sea horse, viking mermaids on April 20, 2015 by littledragonblue. Some things are just private. Sheesh. Bees are fascinating. I can watch them for a long time. Some people freak out about bees, but generally speaking, unless you’re doing something to aggravate them, they’re not going to bother with you. You can just go stand right next to the hive and watch them zooming in and out, hovering as they maneuver through the traffic, zipping off and landing again like little helicopters. I mean, don’t lose your cool if there’s one on your head. It probably just likes the smell of your shampoo. Just having a bee on you usually doesn’t result in a bee sting, unless you freak out and do something threatening, like slapping at it. Most creatures don’t like to be slapped. Try gently brushing it away. If you’re in nature, try to walk through some leaves. In the summertime, they like to visit my swimming pool, which I don’t understand, because it’s saltwater, but that doesn’t seem to deter any creature. The bees misjudge and break the surface tension a lot, though. I’m always pulling them out of the water. I just use my bare hands. They never sting. I like to hold them in my palm and watch them dry their fuzzy selves before they lift off again. I guess they’re too heavy to fly when they’re waterlogged. They’re certainly completely unthreatening in these situations. The only place I’ve ever been stung by a bee is the bottom of my foot: in other words, I actually had to step on one before it tried to hurt me. Bees are super important, obviously, in terms of the health of the environment that sustains us, but also super cool. To me, there really is something very passionate about the bee at work. I’ve had moments watching one penetrate the depths of a flower with regular thrusts, then suddenly turn around and look at me in a way that seemed sheepish. It definitely felt like I was interrupting something. Bees don’t have a work ethic, but they do seem to work ceaselessly. When they’re too old to gather pollen, they do tasks at home. Bees don’t give up; they keep at their job as long as they’re able, and they never require creative inspiration. They just know what to do, and then they do it, and they keep doing it until they die. I’m no busy bee, but in a way I envy their steadfast intention and finality of purpose. If only I could go about my task, day in and day out, with such unyielding determination. ETA: A kindly redditor has informed me that I have the work-life cycle of the bee backward, and that it is the youngest bees who stay at home and care for the hive and the oldest bees who fly out to gather pollen. Reddit has a thousand and one household uses. 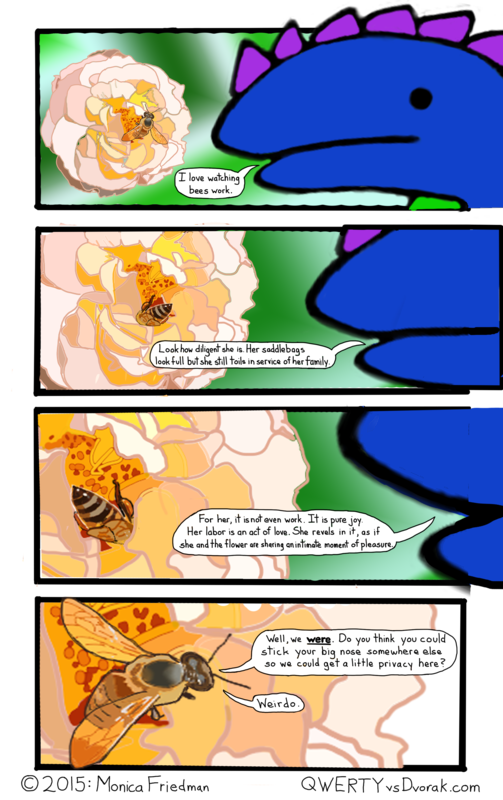 This entry was posted in comic, dragon, dragon comics and tagged beekeeping, bees, comic, dragon, flowers, nosy, spying, voyeuristic, webcomic on April 17, 2015 by littledragonblue. Their sister site offers a sustainable sourced, fair trade, medium roast Ethiopian coffee for manticores. My Internet connection has been intermittent all week for no discernible reason, and tonight it was down for almost an hour. It started to get to the point where it didn’t seem like there would even be any possibility of uploading a comic at all tonight. Also, I had a headache. So I almost didn’t draw it. But it all worked out in the end. I am a fan of sustainably sourced, fair trade, dark chocolate, and I don’t mind paying more for it. Chocolate is one of those things that we really shouldn’t take for granted. It’s worth it to get the highest quality you can, and to make it economically feasible for the people who farm it to continue farming it. People who grow cocoa should be able to live a good life in exchange for their crop, and cocoa should be grown in such a way that humans can continue to grow cocoa indefinitely. Usually I wouldn’t eat a whole bar, or even half of one, in a day. Typically, about 20% of a good dark (72% cocoa) bar satisfies me. Sometimes (like yesterday) it takes about 75%. But even as I gave myself license to eat as much chocolate as I wanted while drawing this comic, I only wanted 20%. When I was little, a Hershey’s Bar was one of my favorite things. I can’t eat any of that type of candy now. If you can get it at the mini mart, it doesn’t do anything for me. Last Halloween I couldn’t even finish a single miniature. It doesn’t satisfy anything. You can’t even get the really good kind of candy at a regular grocery store. You have to go somewhere a little bit upscale. Elitist chocolate. Call me a snob, but the older I get, the less I want to consume low quality anything. My pants are probably from Goodwill, but if it’s going inside me, there are standards. My favorite chocolate, right now, is Endangered Species Chocolate. I like the hazelnut toffee, the almond sea salt, and a couple others (all 72% cocoa). It’s totally fair trade and sustainable and also vegan and organic and gluten free and, if that doesn’t grab you, kosher. I eat between 1 and 3 of them a week, usually, at night, after everyone else has gone to bed, by myself. I almost never share. 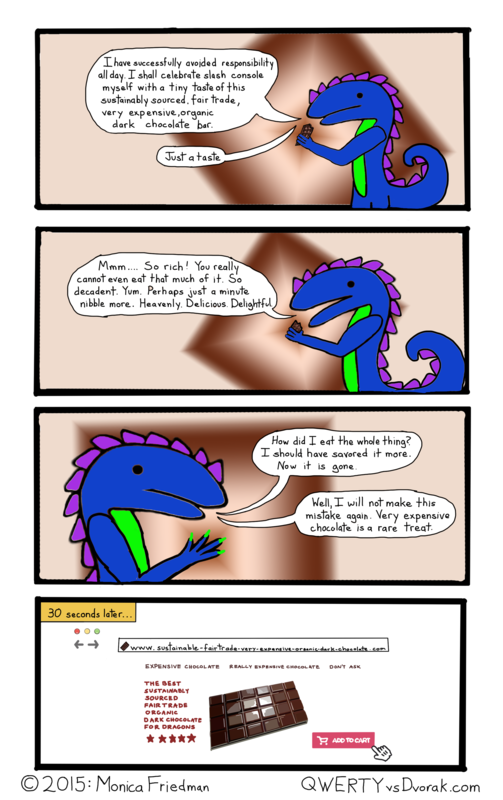 This entry was posted in comic, dragon, dragon comics and tagged candy, candy bar, chocolate, comic, dragon, webcomic on April 15, 2015 by littledragonblue. It doesn’t work of course. Politicians are in your schools, your churches, and your police stations. They’ll get your kids, one way or another. Presidential elections terrify me. Our American political process is so bloated and corrupt. Tempers run high. The country is too big; we’re all too different. No single candidate can satisfy even 51% of us, and for people like me, with political views so far out of the mainstream that no one ever represents us, it’s just a farce. The money wasted is just a slap in the face. How many people could be fed, clothed, and housed for the nearly one billion dollars that a couple of billionaires focused on increasing their own assets casually promised to their favorite candidate? The worst part is the campaigning. It’s not confined to any arena. It’s everywhere, and you can’t escape it, even if you want to. In the last election, I literally couldn’t figure out how to make Google News stop showing me election news. I strongly believe in compartmentalizing, but it’s not possible in presidential elections. Everyone has opinions and everyone shares them everywhere. You can’t not hear the mudslinging and muckraking and empty promises and bombastic bloviation. It used to be considered in poor taste to discuss politics outside of political gatherings. Now it’s considered ignorant to not constantly spew your views regardless of whether or not people care to hear them. When you ask people to change the subject, they refuse. I’d like to see some actual degree of democracy in the political process. The way I see it, it would be most fair to lay things out like this: anyone can establish a candidacy with a certain number of signatures on a petition, but all interested individuals would have to attain their own signatures in the same forum. No advertising in any other forum would be allowed, and in the first round, only position statements could be displayed. People would have to go to this political forum to determine which candidates interested them. Then, there would be a series of run-offs to limit the number of candidates to a reasonable degree, after which each viable candidate would be allotted the exact same amount of money to produce whatever campaign materials they needed, all of which could only be distributed through the same political forum: videos, pamphlets, ads. Debates would all be held on the same forum. We could all vote there, online, as well. It’s the only non-disgusting way I can see it working. Right now what we’ve got is something between an oligarchy and a plutocracy, and it’s not working. Right now, we’d be seriously better off running the presidential campaign like American Idol or Survivor. It would be far more dignified than what we’re going to be subjected to in the next 18 1/2 months. 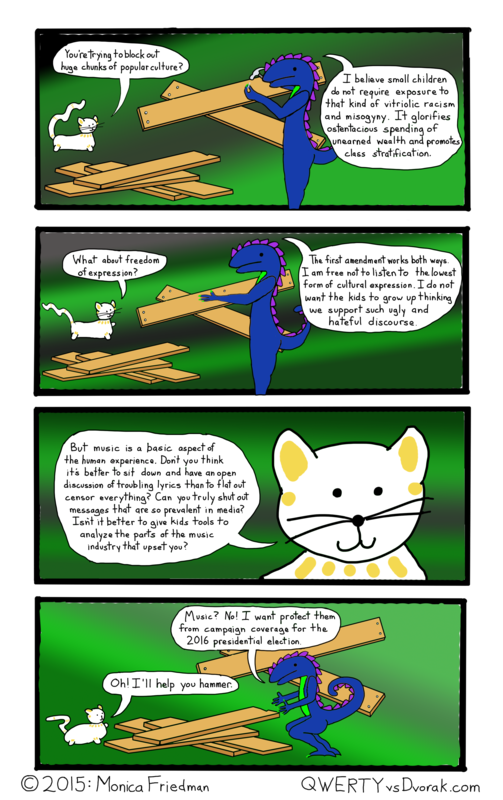 This entry was posted in Comics, dragon, dragon comics and tagged cartoon, censorship, comic, dragon, kitty, political, politics, protection on April 13, 2015 by littledragonblue. Being inappropriate isn’t funny at all. It’s serious, serious business. It takes dedication and endurance. This comic and its accompanying blog post brought to you courtesy of I can’t believe I’m sick again and also by Walgreen’s brand cold medicine. Except actually I can believe I’m sick again because airplanes are basically giant petri dishes. Even so I managed to finish an article about a dinosaur comic and completed the full range of human duties: I cooked, I cleaned, I performed childcare. And I drew this comic, to overall, it’s a win. To hell with you, rhinovirus. Bonus: also had my modestly nsfw XXXenophile post on Panels today. 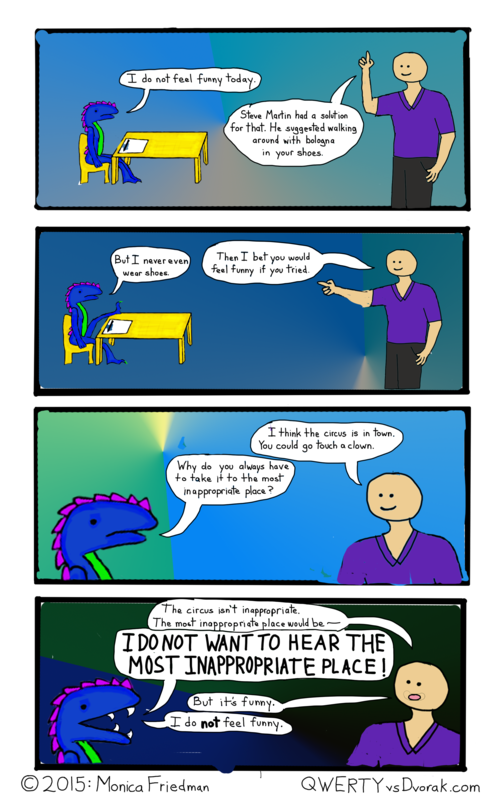 This entry was posted in comic, dragon, dragon comics and tagged comic, dragon, funny, humor, not funny, sick, The Man on April 8, 2015 by littledragonblue. Also, dragons are so pretty they’ll get everything for free. This comic is about privilege. White privilege, class privilege, cis privilege, hetero privilege, whatever. It’s pretty much all the same. I should know, because while people who know me will attest that I’m a freak on, like, a lot of levels, to the casual observer all of that is hidden. What shows on the surface are the lucky accidents of birth. I’m super-privileged. I think about it a lot, even if I’m not talking about it. But it happened again yesterday: I got waved through to the pre-screen security line in one of the world’s largest airports. I didn’t have to wait in line, I didn’t have to take off my shoes or my jacket or take out my computer or my phone. A guy sized me up as I took 3 steps toward him and determined I was not a security risk and forced a privilege upon me. And it occurred to me that this happens as often as not in any big airport. I’ve gotten waved through to the special lane lots of times, and I never get pulled out for extra scrutiny. The only time my luggage has ever been searched was when I borrowed someone else’s suitcase, and unbeknownst to me, this person had left a 6-inch switchblade in the side pocket. The TSA agent pulled it out, laughed, said, “This isn’t yours is it?” and let me go. I was caught carrying a switchblade through airport security, and the federal employee whose job it is to address crime took a single glance at me, determined I was not capable of criminal activity, and laughed it off. We laughed about it together. There was a heartbeat when I thought, “Well, I’m not going to LA today; I’m going to jail.” But I look white, and female, and straight, and well-off, and not like a security risk, so that TSA agent never suspected that I have carried contraband through airport security on more than one occasion. And then there’s all the times in my life that I was doing something illegal and cops didn’t even bother to look twice. Privilege means knowing that mistakes are going to be made in your favor. It’s the freedom to assume that the rules don’t apply to you. It’s a careless security. 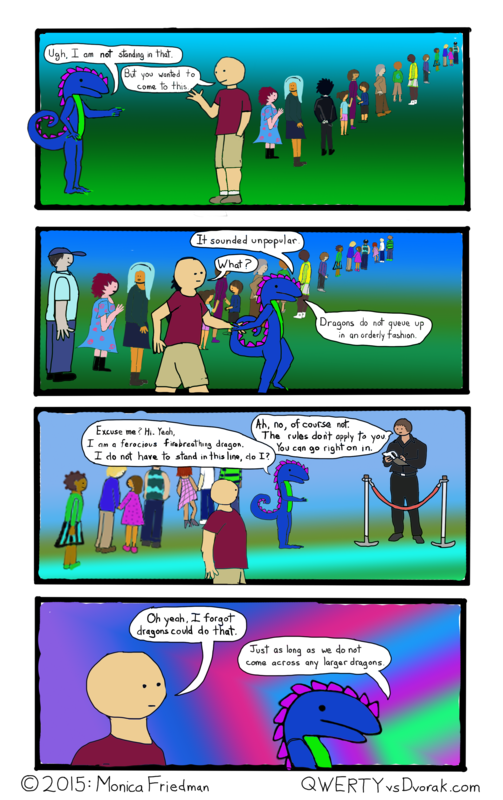 This entry was posted in comic, dragon, dragon comics and tagged airport, bouncer, class, comic, dragon, privilege, queue, security, travel, TSA, waiting, webcomic on April 6, 2015 by littledragonblue. Silly Dragon…beds are for sleeping in, not for obsessing about things you can’t do anything about at the moment. Don’t get me started on what daytime is for. This comic sort of seemed like it should have another punchline in the 4th panel, but the punchline is: insomnia. If have it, you get it. If you haven’t got it, you’re lucky. I’ve had it my entire life. I can literally remember lying in my bed at the age of 3, staring at the ceiling, unable to sleep, even though my parents had long since gone to bed and it was the middle of the night. On a good night, it typically takes me about 45 minutes to go under. Since I’ve been here, it’s more like 4 or 5 hours. Tossing and turning and rolling over to note that the sky is lightening and another day has dawned despite my inability to put the previous day to bed (so to speak) provokes a scary mix of dread and futility. Of course, I still wake up at approximately my regular time, even if I’ve only passed out a few hours before. Then I sleepwalk through the day, vaguely hurting and feeling ineffective. All week. In real life, of course, I sleep next to The Man, who could not accompany me on this trip. So I’m sort of used to his presence, and it makes me comfortable. And I’ve grown accustomed to the sound of his CPAP, which is a sort of reassuring reminder that he’s still breathing, and helps me relax. And we sleep in a queen sized waterbed, which we’ve had for 5 years. When you like sleeping in a waterbed, there’s really no substitute. Well, maybe there is, but a 30-year-old twin mattress on a bunk bed is not it. If there’s an upside to chronic insomnia it’s that lack of sleep skews your perception of time, which can be an upside if it makes the day go by quickly, or if it makes the recent past feel like the distant past. In other words, insomnia makes you suffer, but you experience the suffering in a compressed way, and then file it in your brain as a long-ago memory. 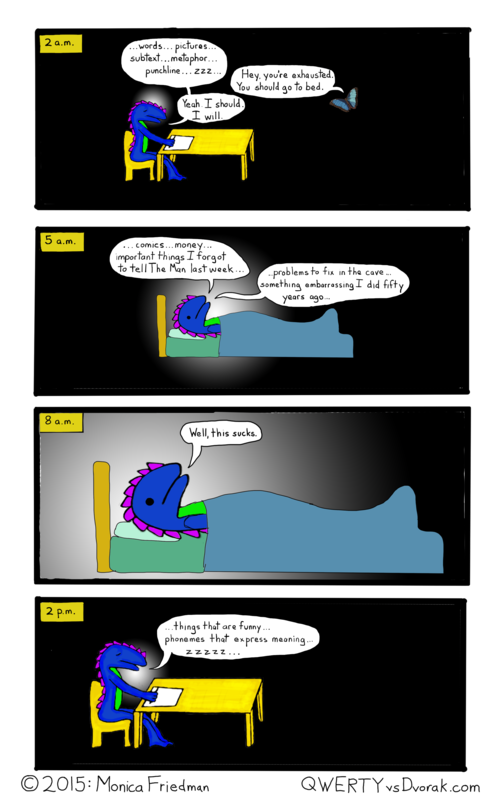 This entry was posted in Comics, dragon, dragon comics and tagged anxiety, bed, comic, dragon, insomnia, sleep, tired, webcomic, worries on April 3, 2015 by littledragonblue.